Comments: The Saga continues with the Emmy-winning Star Wars: Clone Wars, available for the first time ever on DVD. 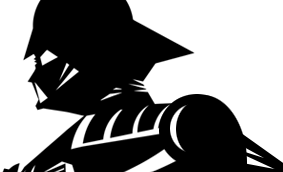 This animated micro-series, directed by Genndy Tartakovsky, captures George Lucas' vision in a dynamic animated style that is a visual delight for all ages. Star Wars: Clone Wars Volume One reveals the epic adventures that bridge the story arc between Star Wars: Episode II - Attack of the Clones and Star Wars: Episode III - Revenge of the Sith. Follow the valiant Jedi Knights and the brave soldiers of the Republic's clone army as they battle against the droid forces of the Separatists, led by the evil Sith Lord, Count Dooku. Witness the battles that made galactic heroes out of Anakin Skywalker and Obi-Wan Kenobi, and along the way get a first look at the new menace from Episode III, General Grievous. 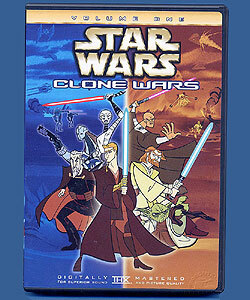 Star Wars: Clone Wars Volume One was originally presented on Cartoon Network in two 10-chapter "seasons." Chapter 1 originally aired on November 7, 2003. Chapter 2 originally aired on November 10, 2003. Chapter 3 originally aired on November 11, 2003. Chapter 4 originally aired on November 12, 2003. Chapter 5 originally aired on November 13, 2003. Chapter 6 originally aired on November 14, 2003. Chapter 7 originally aired on November 17, 2003. Chapter 8 originally aired on November 18, 2003. Chapter 9 originally aired on November 19, 2003. Chapter 10 originally aired on November 20, 2003. Chapter 11 originally aired on March 26, 2004. Chapter 12 originally aired on March 29, 2004. Chapter 13 originally aired on March 30, 2004. Chapter 14 originally aired on March 31, 2004. Chapter 15 originally aired on April 1, 2004. Chapter 16 originally aired on April 2, 2004. Chapter 17 originally aired on April 5, 2004. Chapter 18 originally aired on April 6, 2004. Chapter 19 originally aired on April 7, 2004. Chapter 20 originally aired on April 8, 2004. Click here for the official Rebelscum review of this DVD.